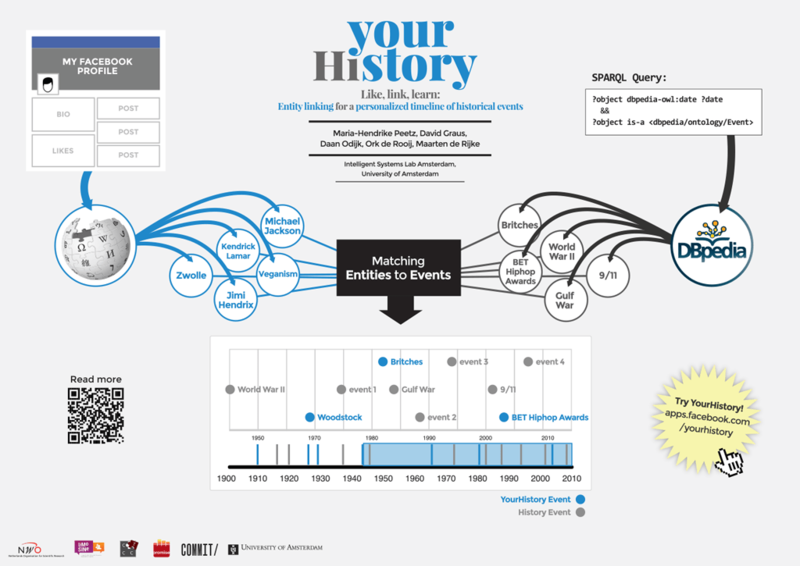 Download a pre-print of Graus, D., Peetz, M-H., Odijk, D., de Rooij, Ork., de Rijke, M. “yourHistory — Semantic linking for a personalized timeline of historic events,” in CEUR Workshop Proceedings, 2014. And we got nominated for the “Innovation & Entrepreneurship Award” there! (sadly, didn’t win though ;) ). 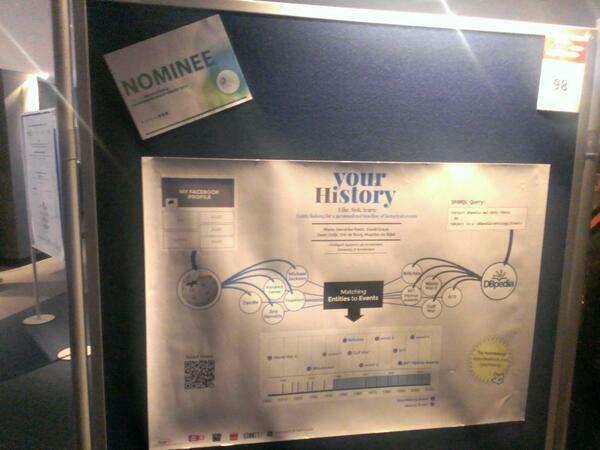 For the LinkedUp Challenge Veni competition at the Open Knowledge Conference (OKCon), we (Maria-Hendrike Peetz, me, Daan Odijk, Ork de Rooij and Maarten de Rijke) created yourHistory; a Facebook app that uses entity linking for personalized historic timeline generation (using d3.js). Our app got shortlisted (top 8 out of 22 submissions) and is in the running for the first prize of 2000 euro! In history we often study dates and events that have little to do with our own life. We make history tangible by showing historic events that are personal and based on your own interests (your Facebook profile). Often, those events are small-scale and escape history books. By linking personal historic events with global events, we to link your life with global history: writing your own personal history book. And try out the app here! It’s currently still a little rough around the edges. There’s an extensive to-do list, but if you have any feedback or remarks, don’t hesitate to leave me a message below! For a top-secret project, I am looking at retrieving all entities that represent a ‘(historic) event’, from DBPedia. Now I could rant about how horrible it is to actually formulate a ‘simple’ query like this, using the structured anarchistic Linked Data format, so I will: this request “give me all entities that represent ‘events’ from DBPedia” takes me 3 SPARQL queries, since different predicates represent the same thing, but probably I need a lot more to get a proper subset of the entities I’m looking for. Currently, I filter for entities that have a dbpedia-owl:date property, a dbprop:date property (yes, these predicated express the exact same property) and entities that belong to the Event class. Which is interesting, because it shows how there are loads of events in the near past, and around WWII, and around WWI. 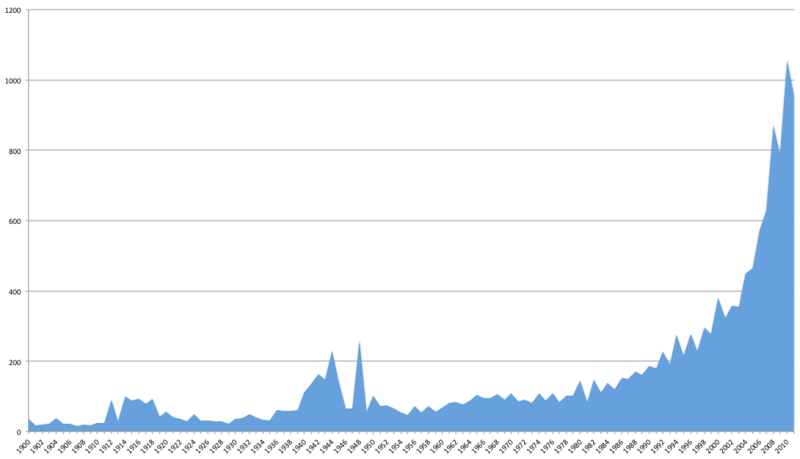 I could now say something about how interesting it is that our collective memory is focused on the near past, but then I looked at the events and saw loads of sports events, so I won’t, but rather say that back in the days we were terrible at organizing sports events. Still, the knowledge that between 1900 and today a total of 16.589 events happened seems significant to me. Just a quick update to let myself know what’s going to happen next: It’s time to produce some results! While I was getting quite stuck in figuring out the best – or rather, most practical – way to extract keywords from a text (and not just any text, mind you, but notes of biologists), my supervisor told me it’s time to get some results. Hard figures. I decided to scrap POS-tagging the notes to extract valuable phrases, after I noticed the accuracy of the default NLTK POS-tagger was way below practical usage. Not too surprising, considering the default NLTK tagger is probably not trained on biologists’ notes. The first being the biologist’s notes (the Cyttron DB). Alzheimer, Apoptis, Tau protein & Zebrafish. Each of these ways of representing the source information can then be ‘boosted’ by using WordNet to generate synonyms, doubling the ways of representing the data (2×5=10!). Matching the sources to descriptions of ontologyterms, using the same two sets of ontologies. If I manage: Matching the datasources to ‘context‘ of ontology terms. I started working on a method to take a term in an ontology and explore its surrounding nodes. I will collect all ‘literals’ attached to a node, and throw them in a big pile of text. I will then use this pile of text as a bag of words, to match to the datasources.